DOSS SoundBox XL comes from the manufacturer called DOSS AUDIO which is another Chinese audio manufacturer. They usually make entry-level Bluetooth speakers but SoundBox XL was supposed to be their premium unit. DOSS SoundBox XL is, just like all the other DOSS speakers, mostly made of plastic and it’s actually another affordable budget speaker that looks pretty good (even premium). The best thing about SoundBox XL is the sound. It sounds better than most of the other budget Bluetooth speakers under $100. It can even compete with much more expensive speakers of similar size (like Sony XB40). 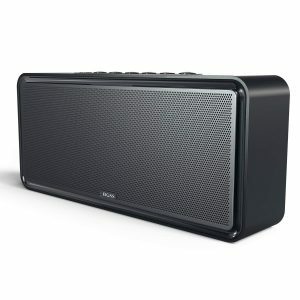 The starting price for the SoundBox XL was way too high (more than $100) but it dropped fast. Today, you can have this speaker for less than $60. Besides great sound quality (very balanced sound), other notable features are battery and connectivity options (Bluetooth, AUX, micro SD card). You should also be aware of some important downsides like the lack of IPX rating (the speaker is not waterproof), as well as the lack of speakerphone and NFC quick pairing feature. SoundBox XL might not be the best choice if you need a portable and rugged/waterproof outdoor Bluetooth speaker but if you need an affordable and great sounding portable Bluetooth speaker under $100, SoundBox XL might be one of the best options. If you are looking for a budget-friendly (under $60) portable Bluetooth speaker that sounds like a much more expensive unit, SoundBox XL is the right speaker for you. SoundBox XL comes in a nice-looking box (almost premium-looking box), along with charging cable (not USB to micro USB charging cable), 3.5mm auxiliary cable, user manual, and 1-year warranty card. The design is kind of basic, minimalistic, and boxy. The speaker is mostly made of plastic but it actually doesn’t look cheap like other plastic speakers. SoundBox XL is well put together – when you look at it from a distance, you may even get the impression that it’s a premium unit. The whole front panel is covered with a gray aluminum grille. The grille is removable. The speaker sounds better (more balanced) when you remove the grille but it looks much better with the grille. All the control buttons are located on the top panel. The part of the top panel where all the buttons are located is made of brushed metal. There are 7 control buttons – power, MODE button with 4 LED indicators (Bluetooth, AUX, micro SD card, and battery status indicator), 2 volume buttons, 2 track buttons, and play/pause button. The rear panel is completely made of plastic and looks really cheap (unlike the rest of the speaker). All the inputs (12V DC input, AUX input, micro SD card slot) are located at the bottom. On the bottom, you will see 4 small rubber feet that keep the speaker in place. SoundBox XL has a built-in rechargeable 2,200mAh lithium-ion battery which can deliver up to 9 hours at 50% volume which is decent playtime for the price. When it comes to connectivity, you have 3 different options – Bluetooth (version 4.2) with up to 33ft range, AUX input (3.5mm audio cable is included), and micro SD card slot (micro SD card not included). The overall build quality is pretty good, but have in mind that it’s mostly made of plastic. Still, we can’t deny that it looks kind of premium. The controls are super-simple and you won’t need to go through the manual to learn how to use them. You should know that SoundBox XL lacks some features. This speaker doesn’t have the built-in microphone (no speakerphone feature), it doesn’t feature NFC, and it can’t be paired with another SounBox XL. Also, that battery status LED indicator is not very helpful since you never know how much battery is left. The LED is blue when there is enough battery and it flashes red when the battery is low. You will never know if the battery is at 80% or at 30%. When it comes to performance, we don’t really have any major complaints. The speaker works as advertised. The manufacturer claims that the playtime is 10 hours, but we’ve got 8.5 hours at 50% volume (4 hours at full volume). Recharge took 2.5 hours. The Bluetooth 4.2 range is estimated at 33ft but depending on the phone you are using, you can get up to 80 (Samsung S8) or even 100ft (iPhone 8 and iPhone X) before the sound starts to cut out. Pairing is simple and quick and it will start the moment you choose the Bluetooth mode by pressing the MODE button (there’s no dedicated pairing button). There’s no NFC tag so the Android users will have to go through the same pairing process as iPhone users. Also, you can’t pair two SoundBox XL speakers wirelessly. We have noticed one funny thing – the engineers from DOSS used windows sounds for the sound prompts. For example, you will hear windows alert sound when you turn on the speaker. The sound quality is, by far, the best thing about SoundBox XL, especially if you are into more balanced sound. The bass response is impressive for a speaker of this size. Compared to some much more expensive speakers like XB40, it offers a slightly smaller amount of bass but it is cleaner and less boomy (have in mind that XB 40 costs almost $200 more than SoundBox XL). There is some bass boost in the higher bass frequencies but it’s not overwhelming. Compared to some smaller JBL speakers, like JBL Charge 3 (approx. $120), SoundBox XL actually delivers richer and fuller sound. Mids and voices sound clear and detailed and the bass doesn’t affect the lower midrange frequencies at high volumes (it doesn’t make them muffled). The soundstage is acceptable for the speaker of this size. Stereo separation is poor but that’s expected considering how close the drivers are. Some high frequencies might sound a little bit too intense, but it’s not disturbing and it doesn’t ruin the overall experience. The speaker can get very loud but it can’t compete with much more expensive speakers of the same size (XB40, JBL Extreme). To conclude, SoundBox XL delivers very clean and balanced sound. If you are more into the bass-oriented sound signature, you are not going to like this speaker. 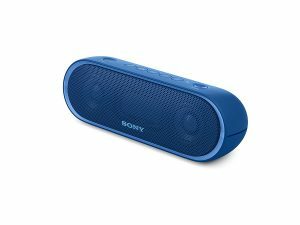 Sony XB20 is more expensive than the SoundBox XL and it’s better in many ways but it doesn’t deliver more balanced or louder sound. XB-20 is bass-oriented and it even has an extra bass (bass boost) feature. If you don’t like that kind of bassy sound signature, XB-20 is not for you. In all the other aspects, Sony XB-20 is better. It looks better and it has the LED lighting which makes it much more fun. It’s also lighter, slightly smaller, and more rugged. It features IPX5 water resistant rating (Soundbox is not waterproof at all). The playtime is similar – SoundBox can deliver up to 9 hours at 50% volume and XB-20 offers 12 hours at 50% volume. XB-20 can be paired wirelessly with multiple XB-20 speakers (party chain feature). XB20 can be controlled via the SongPal app while there is no app for SoundBox XL. Clip 3 and Soundbox XL are priced the same but they have a completely different purpose. Soundbox XL delivers fuller, richer, deeper, and louder sound but it’s not rugged nor waterproof. Clip 3 is designed for outdoor use – it’s very rugged (shock proof, drop proof) and it’s IPX7 certified (fully waterproof). Clip 3 also features a built-in mic (speakerphone feature). They both deliver the same playtime. Clip 3 looks so much better than SoundBox and it’s available in many colors while there’s only one version of SoundBox XL. 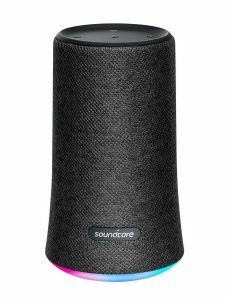 Soundcore Flare is also priced the same as SoundBox XL. XL offers more balanced, louder, fuller, and deeper sound but Soundcore Flare delivers 360-sound. You can pair two Soundcore Flare speakers together for louder or stereo sound while you can’t daisy chain 2 SoundBox XL speakers. Flare looks better and it has some nice lighting at the bottom. It is also IP67 certified (waterproof/dustproof) and it’s more suitable for outdoor use. Flare also comes with the Soundcore app. There’s no app for SoundBox XL. At the end of the day, it all comes down to your needs and budget. If you can get over all the downsides (not waterproof, not rugged, no NFC, no speakerphone) and you are looking for loud, balanced, and rich sound in a compact box, you are going to love SoundBox XL. If you need something rugged or waterproof, don’t buy this one. Sony XB20, JBL Clip 3, and Soundcore Flare are all better options for outdoor use and they are all within the same price range (under $100). 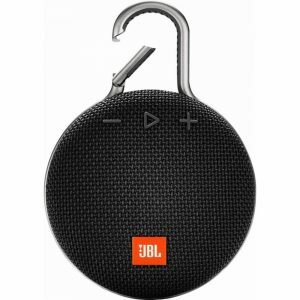 How does it compare to jbl flip 4? The shortest possible answer would be: DOSS SoundBox XL sounds better (clearer, more balanced, and a bit louder) while the JBL Flip 4 is better in all the other aspects. Flip 4 looks better, it’s much more rugged (IPX7 fully waterproof VS no IPX rating), it has a larger battery (3,000mAh VS 2,200mAh), and it delivers longer playtime (12 hours VS 8.5 hours). Flip 4 supports daisy chaining – you can pair (wirelessly) more than 100 speakers and get a crazy loud sound or you can pair two Flip 4 speakers in stereo mode and get better stereo separation. SoundBox XL can’t be paired with another SoundBox XL.